Make Martha Stewart's Lemon-Yogurt Cupcakes recipe from the Better (For You) Bake Sale episode of Martha Bakes. Make the Cupcakes: Preheat oven to 350 degrees. Line 12 muffin cups with paper liners. In a bowl, whisk together flour, baking powder, baking soda, and salt. In another bowl, with an electric mixer, beat butter, sugar, and lemon zest on medium until well combined, about 3 minutes. Beat in lemon juice, vanilla, and egg. Add flour mixture in three batches, alternating with two additions of yogurt and beating until just combined (do not overmix). Divide batter evenly among muffin cups. Bake, rotating pan halfway through, until cakes are golden and a tester inserted in centers comes out clean, 18 to 20 minutes. Transfer tin to a wire rack and let cakes cool completely. 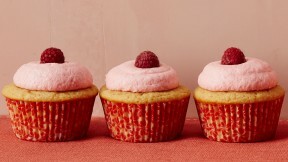 Make the Frosting: In a food processor, puree berries with can sugar until smooth. Pass mixture through a fine sieve into a bowl, pressing to extract as much liquid as possible. In another bowl, with an electric mixer, beat butter on medium-high until pale and fluffy, about 2 minutes. With mixer on medium, add confectioners’ sugar, ½ cup at a time, beating well before adding each addition. Beat in berry puree. Use an offset spatula to spread frosting over each cupcake. Unfrosted cupcakes can be kept in an airtight container at room temperature up to 2 days. Frosting can be refrigerated up to 2 days; bring to room temperature, and beat on low until smooth again before using. Reprinted from A New Way to Bake: Classic Recipes Updated with Better-for-You Ingredients from the Modern Pantry by the Editors of Martha Stewart Living. Copyright © 2017 by Martha Stewart Living Omnimedia, Inc. Published by Clarkson Potter/Publishers, an imprint of Penguin Random House LLC.